“Isn’t that Mommy’s doctor friend?” she whispered. She raised her small hand and pointed behind him. “Mommy didn’t have any doctor friends.” He tried to keep his voice down. He faced forward, eyes on his full grocery cart and the person ahead of him in the checkout line. He didn’t turn to look, didn’t need to. He knew exactly whom Sophia was talking about. Cash stifled an inward groan. Sophia obviously wasn’t going to give this up. He half-turned and crouched in front of her. As he did, he caught a flash of long, chestnut-colored hair from the corner of his eye. She shook her head, her big blue eyes wide and solemn. Cash stood up again. Why did they have to come shopping on a Saturday when the lines were crazy? Because he was a working, single parent and this was the only free moment he’d had all week to sneak in the trip. Bare cupboards sucked. That was why. He glanced at the case of beer and bags of pretzels that Chip Dillon was purchasing just ahead of him. Obviously out to raise some hell. Too early for football. Maybe Chip and his buddies would be watching some NASCAR or the Texas Rangers game. Maybe they’d even hit the Yellow Rose, the most popular bar in town, afterward. Cash gave a mental shake of his head. Those days seemed like a different lifetime…making him feel a helluva lot older than only twenty-eight. He could practically smell the stale beer, peanuts and sweat…hear the crack of balls being broken at the pool table over the music of the live country band and his friends’ raucous laughter as they swapped tales of their latest conquests. Maybe he’d ask Mama to watch Sophia one night and go out with his brothers. They hadn’t spent much time together lately. He could use a night out with the guys. He hadn’t done anything like that since his wife died over a year ago. Hadn’t been interested after he found Georgia’s note. Not that he’d give up even a second of what he had now. Sophia was the most precious thing in the world to him. Hard as it was to act as both mother and father to her, he adored that little girl. And he’d make damn sure no one ever hurt her. She’d already had enough pain in her young life. That was why he was so concerned with Sophia’s obvious interest in Holly Jensen—the new large animal vet in the area. Because Holly had been Georgia’s best friend, and she carried her own baggage. The two women both had a habit of walking away from family. Cash shook off that thought and glanced at his daughter…only to find her gone. He frowned but didn’t panic. She couldn’t have gone far. “Sophia?” He looked around the checkout counters in the grocery store. She didn’t answer, and he couldn’t see her. “She’s down there,” Mrs. Ford, the elementary school principal, said from behind him. She pointed toward the aisle where he’d seen Holly disappear. Cash walked up the row of canned fruits and vegetables. His daughter had her back to him and seemed to be animatedly talking to Holly. For her part, Holly squatted in front of his daughter, listening intently. When Sophia stopped talking, Holly murmured something in response. The words were too soft for him to hear, but Sophia giggled. Cash froze in his tracks. He hadn’t heard that sound from his daughter in over a year. Not since her mama passed away. Their daughter had turned from a vivacious, outgoing child into a silent ghost, and now her first laugh was with the one woman he wanted to keep her away from. Holly’d always made people laugh, even in high school—something about her shy demeanor combined with an unexpected sense of humor. She’d made him laugh, too. But Cash knew exactly who Holly was, and he wanted nothing to do with her. Still, the sound of his daughter’s giggle was an arrow straight to his heart. Cash couldn’t decide if he wanted to kiss Holly for doing what no one had managed in all this time—or glare at her for intruding on his life and bringing up memories best left buried. Why’d she have to come back to La Colina anyway? She had no friends or family left here. Holly suddenly glanced up over Sophia’s head. Her eyes were still stunning, even from this distance, an unusual shade of bottle green. Just like that, when she trained her focus directly on him, a bewildering effect overtook him. Pure unexpected heat. He clenched his hands at his sides. Cash didn’t react to women. Not anymore. Not after his wife. Especially not this woman. The sunny smile Holly bestowed upon Sophia faded in the face of his stoic regard. A small amount of guilt slithered through him at that—as if he’d just kicked a puppy—but he pushed it aside. “Looks like your dad found you.” She motioned to him as she stood. Her bright purple toenails peeped out from beneath her black, floor-length skirt. What kind of large animal vet in Texas painted her toenails purple? Then again, she’d always dressed to please herself. He’d suspected, back in school, that her clothes were more a defense mechanism. An armor of sorts, against kids who’d made fun of her. Holly’s family hadn’t had much money. Rumor had it they bought all their clothes secondhand in Austin. Sophia turned to look over her shoulder, pulling his attention away from the woman’s feet. “Yes. He’s the sheriff now,” she proudly informed Holly, turning back to her. “Only temporary until the election,” Cash corrected. “But I wanted to say hi,” Sophia pointed out with the logic of an almost five-year-old. Her lower lip trembled, and Cash’s heart cracked. She was more sensitive these days, so different from the spunky kid she’d once been. Sophia wiped her eyes. “Okay,” she said in a tiny voice. Holly shifted that green-eyed gaze back to Cash as she stood, and he blinked. She bit her lip, drawing his attention to its fullness, and a totally unwanted desire stirred with another wave of shocking heat. He squashed it as he would a black widow. Desire for this woman was as unacceptable as it was ridiculous. He’d been without a woman’s company for too long was all. It was the only explanation that made any sense. Politeness forced him to take her proffered hand, delicate in his own, and give it a brief shake. She hadn’t been able to because he’d stayed clear of her, not wanting to make a scene. He could tell she’d been about to say something trite like: “I know you must miss her.” But given his stony expression, he wasn’t surprised when she decided to cut this conversation short. Exactly what he’d been going for. “You were my mama’s friend?” Sophia’s upturned face was suddenly animated. Cash was torn. He didn’t talk about Georgia, not to anyone. However, based on her rapt attention, clearly Sophia was thirsty for details about her mother. He hadn’t realized. His glance fell on those purple-painted toenails again; only this time, she scooted one foot beneath the hem of her skirt, like she was hiding from him. Had he made her uncomfortable? Another odd shot of guilt oozed through him. Cash held out his hand for his daughter. He gave Holly a single nod before turning away and heading back to the checkout counter. He paid for his purchases, left the store and loaded everything in the truck without another glimpse of Miss Holly Jensen. Despite her unusual effect on Sophia—and him for that matter—he was determined they keep their distance from each other. He wanted nothing to do with Holly. Sophia didn’t need that kind of person in her life. Besides, anyone who dressed like a gypsy, put a hot-pink streak through her hair and painted her toenails purple—especially in conservative, rural Texas—wasn’t exactly the best influence on his daughter. And why the hell did he care anyway? “Miss Holly was really nice. I remember her on the computer.” She was talking about how Georgia used to Skype Holly all the time. As sheriff, Cash assumed he’d have very little to do with the vet. Granted, as ranchers, his family might interact with Holly from time to time, of course…but he wouldn’t. He refused to admit he felt any attraction to her. He’d thought her sweet in high school; now he refused to think about her at all. Though any time their paths crossed since Georgia had died—only from a distance until today—his gaze seemed drawn to her of its own accord. A situation he found extremely irritating. And now, his daughter appeared to have attached herself to the one person he’d rather avoid. 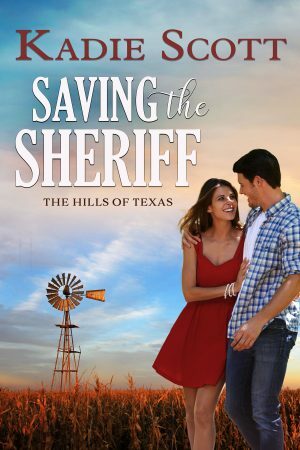 Did you know that Saving the Sheriff and many titles are available digitally from Tule's own bookstore? Check it out!